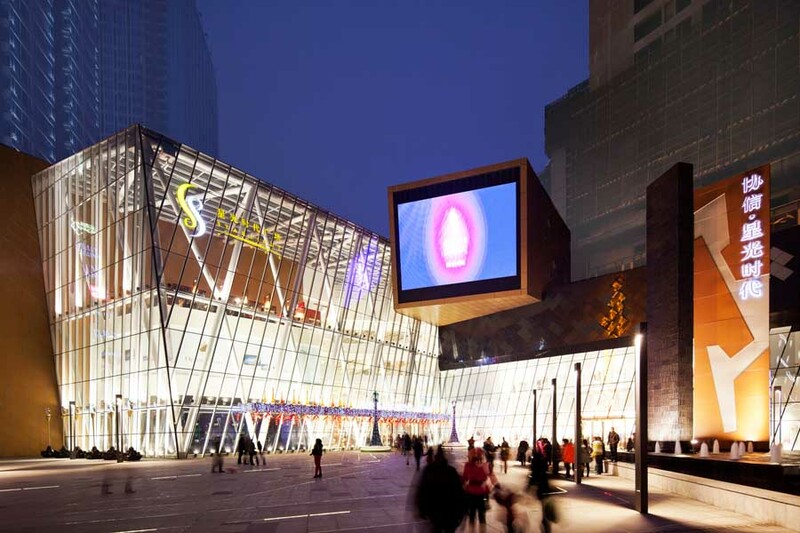 Starlight Place, the latest shopping mall designed by Aedas, officially opened its doors to its customers in Chongqing, PRC last month. With its unusual and dynamic angular forms, the iconic mall has become one of the few landmarks in the city since completion that is picking up speed in its development. Chairman Keith Griffiths, General Manager in Greater China Ken Wai, Executive Director Ping Xu and others were in this booming city to join the grand opening ceremony graced by government officials and celebrities. Leveraging on the prominent site location adjacent to the newly built metro monorail line, Starlight Place on Jiang Nan Avenue was designed to become a landmark building that celebrates Nanping district as the southern gateway to the city centre and enhance its status as a commercial and business hub within Chongqing. The design of the shopping mall uses dynamic lines and stretched forms to create a powerful and iconic architectural statement which dominates the length of Jiang Nan Avenue. The external forms were inspired by the undulating mountainous topography of Chongqing and the dynamic, enthusiastic energy so evident in its residents. The eye-catching forms are accentuated by the bold contrast of materials – polished black granite, grey aluminium and copper-toned cladding. The fenestration and cladding patterns are not applied in the conventional vertical / horizontal manner, but rather in a clashing manner of angles that further compliment the dynamism of the forms. The architectural design also responds to the distinct climatic conditions of Chongqing which were thoroughly analysed and considered. For example, unlike other Chinese cities, Chongqing has very little direct sunlight and so Starlight Place is able to have a generous glass atrium skylight to bring natural daylight deep into the shopping mall public spaces. The landscape design is strongly influenced by the shopping mall architecture and thereby takes on many of the same inspired angular forms and patterns. Paving patterns, signage and sculptural works of art all display the theme. As an interesting contrast, the Interior design concept by Aedas Interiors is a reaction to the angular boldness of the external architecture. The concept is ‘opposites’ – the mall interior compliments the strong angular design of the exterior by choosing soft and curvaceous forms, deliberately avoiding sharp edge. It also represents the softer, tender side of Chongqing people’s personality and nature. The colour palette is also softer and less striking than the exterior. The quality of design is complimented by the list of tenants at Starlight Place which has established it as the premier interior shoppers’ destination in the south western district of Chongqing, and together with the 4000sq m glass skylight and nearly 3000 parking spaces, Starlight Place has been hailed as the most anticipated mall in Chongqing. The landmark mall has already attracted nearly 250 renowned local and international brands. Notable tenants include CRC Vanguard, H&M, Max & Co., DKNY, Juicy Couture, Armani Jeans, Miss Sixty, Adidas Originals, MUJI, Jinyi IMAX cinema, and many distinguished restaurants such as South Beauty. Of particular accomplishment is that Starlight Place has the largest Apple Retailer and flagship Zara store in Chongqing, the very first Costa Coffee in Chongqing and has the very first GAP store in the whole of southwest China. Aedas was responsible for the architecture, interiors, landscape and graphics and branding strategy of the project.